BLT Newspaper article - FUTURE-PROOFInc. On wednesday 21st of November a press conference took place in Karlskrona where the winners of the The Sparbankstiftelsen Kronan award presented their thesis ‘Mind the Gap! Strategically Driving GRI Reporting Towards Sustainability‘ and answered questions. Unfortunately we were not able to attend the press conference other then by Skype. 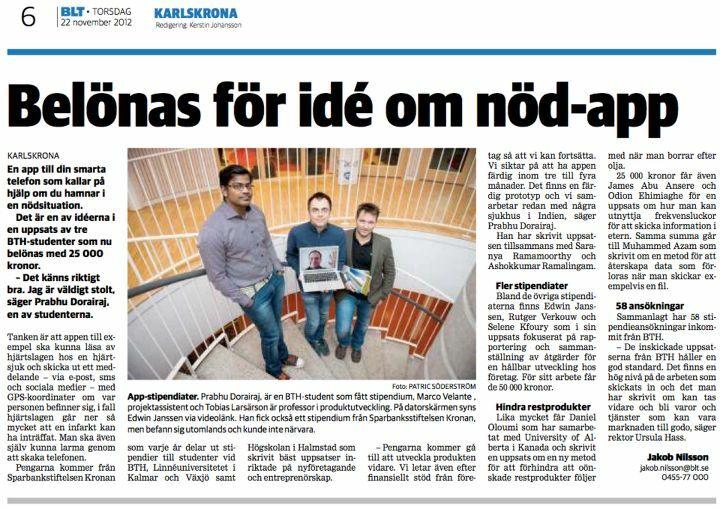 The presentation resulted in an article in the local BLT newspaper (see photo). The Sparbankstiftelsen Kronan award is an initiative of Swedbank. More on the award ceremony.